Just after smashing a BodyCombat class at Floreat, Elwyn, Kar Kiat, Ewen and I decided to reward ourselves with a post combat brunch at Cup and Co. Cup and Co is a small cafe located along Muriel Avenue in Innaloo. The dynamic duo behind Cup and Co is Simone and Paul. At Cup and Co, Simone uses his skill and specialises in making the best coffee and Paul is the man behind the kitchen, who worked previously at Vans, Aubergine and 47 Kirwan Street. Elwyn had the hot dog ($20.50) comprising of grilled sausage, bacon, spinach, roast tomato, Havarti cheese, pickled onions, sriracha mayo and fried egg. The fried egg was perfect with oozing yellow liquid. I sneaked a taste of Elwyn’s dish and it was really flavoursome and hearty. 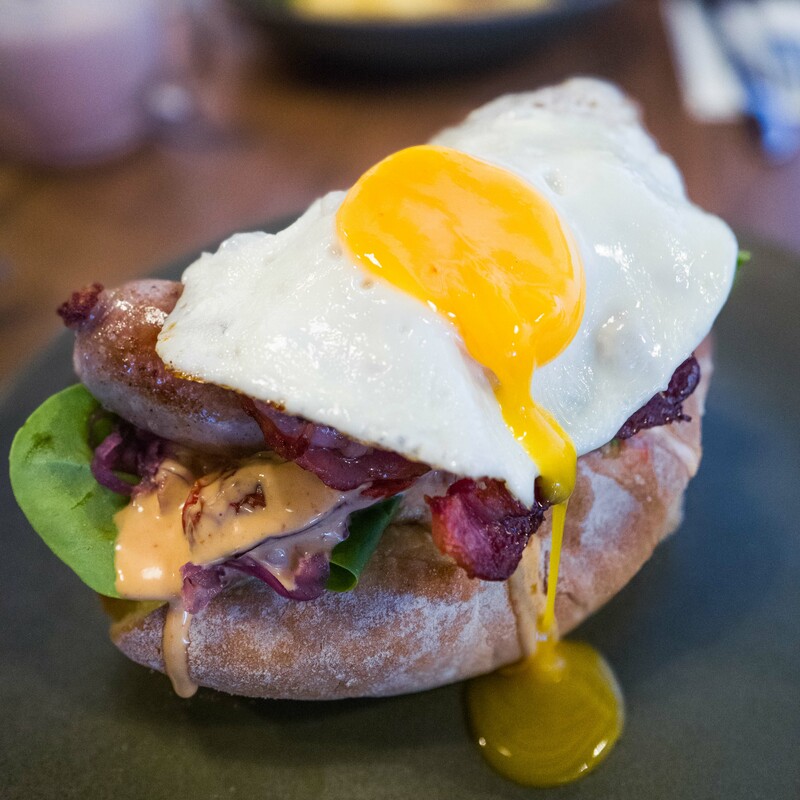 The grilled sausage was cooked to perfection, meaty and tasty, complementing well with the crisp bacon and the spicy, creamy texture of the sriracha mayo. 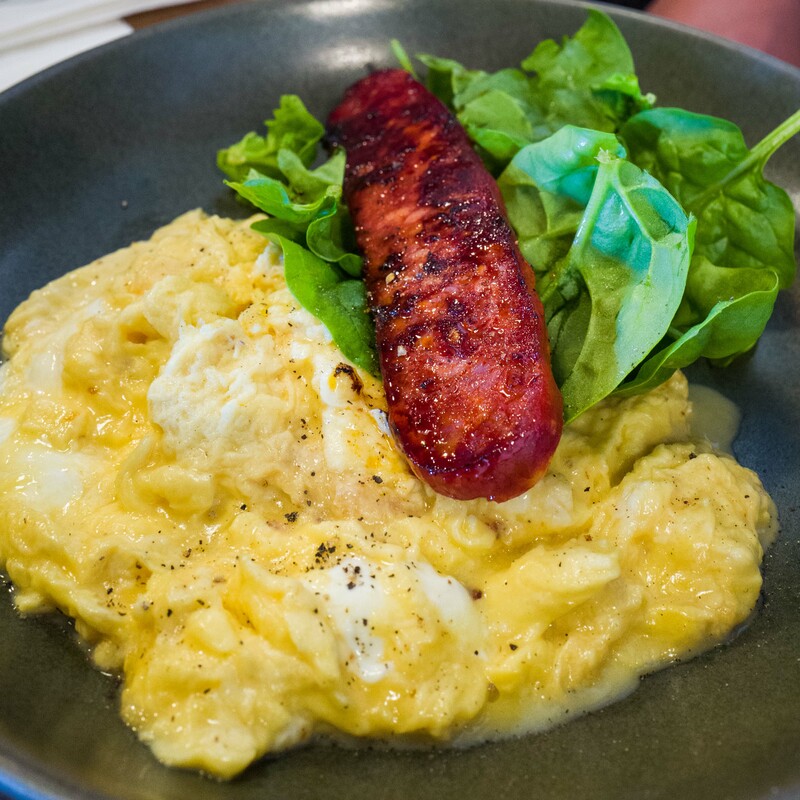 Ewen had the scrambled eggs, persian style feta, spinach and chorizo sausage ($19.50). We agreed that the scrambled eggs was indeed the highlight of this dish – it’s rich, fluffy with a creamy texture. In the sea of scrambled eggs, you could find little feta pieces which gave a salty and tangy flavour to the dish. 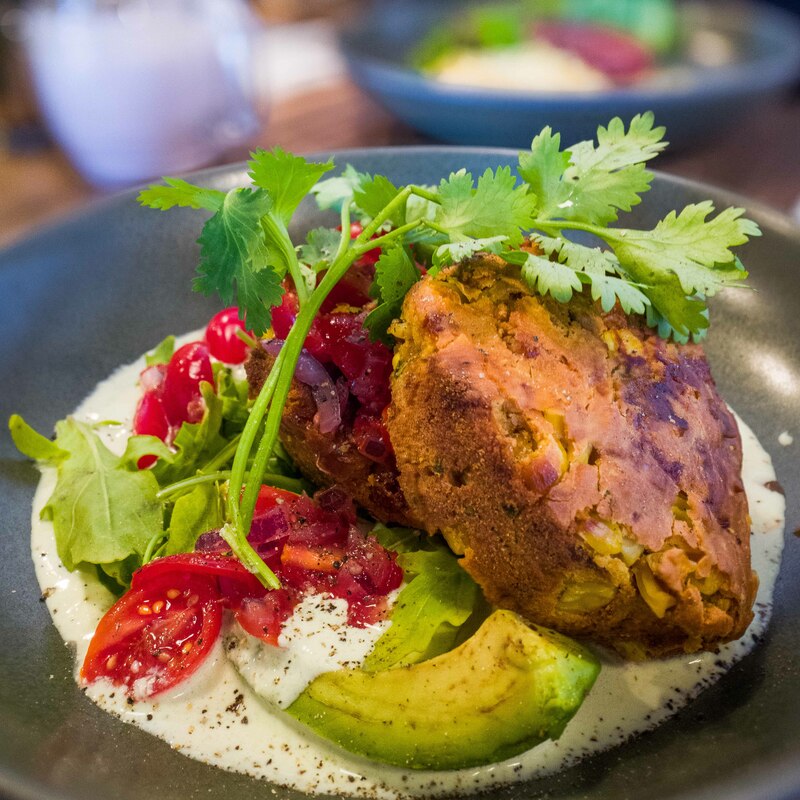 Kar Kiat had the cornbread, avocado, rocket, tomato lime salsa with Jalapeno sour cream ($16.50). If you love your chilli kick, you are going to love this dish. It’s a dish bursting full of colours and flavours. The corn bread was slightly crusty on the outside with a soft texture inside. I love how the tomato lime salsa gives the dish it’s fresh flavours with a punch of acidity. The spicy flavour of the dish comes from the Jalapeno sour cream giving you a good chilli kick. 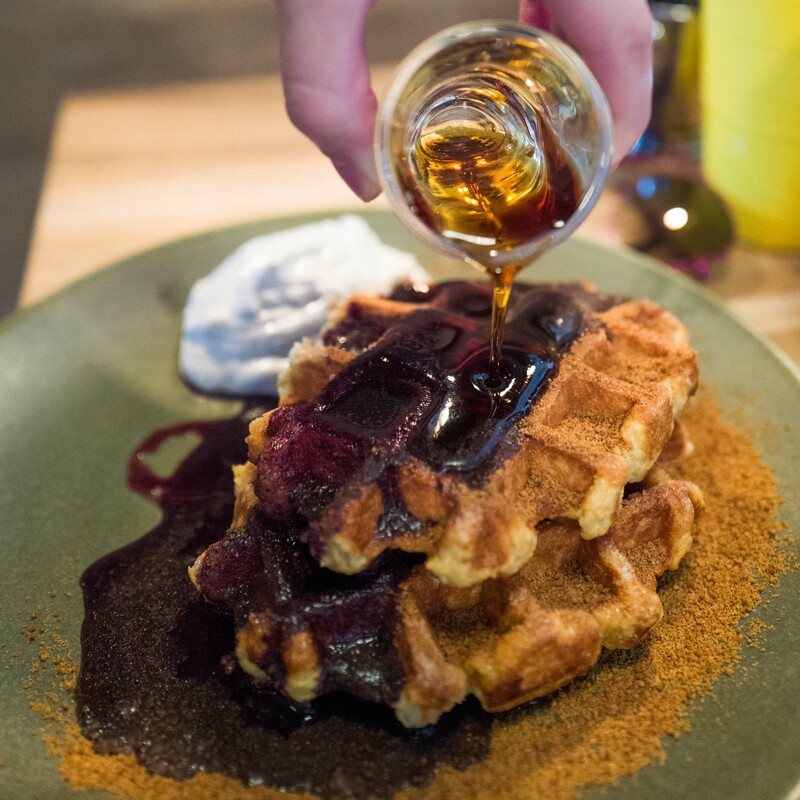 As the guys had their savoury dishes, I opted for a sweet dish which was the belgian style waffles, cinnamon sugar and blueberry syrup ($14.50). The waffles were soft and fluffy with a little crisp around the edges. Yes, I am a sucker for cinnamon and I love the strong cinnamon flavours from this dish. The blueberry syrup on top gives a hint of sweetness to the waffles and surprisingly, the flavours marry well with each other. It’s definitely great to see more cafes opening within my area so I wouldn’t have to travel so far for brunch or face the dilemma of finding parking. That’s the beauty of suburban cafes. The service at Cup and Co was excellent – friendly and welcoming. We will definitely be back to Cup and Co again. It’s a hidden gem!